There is nothing better than going out on hot summer nights! We show off our tanned skin, seduce with sun-brightened locks and gloss-tinted lips. Choosing a nice dress to a summer night cocktail is a part of success. Picking the right jewellery will make us stand out in the sun-kissed crowd. 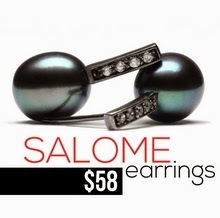 This year's trend is big and bold, so dare to go for these large, round, and shiny pearls! And why not getting them in black? After all, black is the perfect finish to looks that show off some skin.